Do you have leaking tie rods in your basement? STOP Water- The A-1 method of injecting with electric pumps using closed-cell polymer resins, epoxies, and weave carbon fiber permanently seals the tie rod. Each method has its unique advantages and we match the proper repair method to your situation. INCREASE Sale ability and property value- A leaking tie rods needs to be repaired before listing a property. This will increase the pool of buyers since some buyers will run from your property if they see a tie rod that has not been professionally repaired with a warranty. AVOID Health hazards- A leaking tie rod can allow water, odors, and water vapors into your basement. These will contribute to the growth of mold and mildew spores that can trigger respiratory and other health problems. If not caught quickly, these mold and mildew spores can spread rapidly and cost thousands of dollars to remove. Established in 1993, Unmatched knowledge and skills for crack repair. 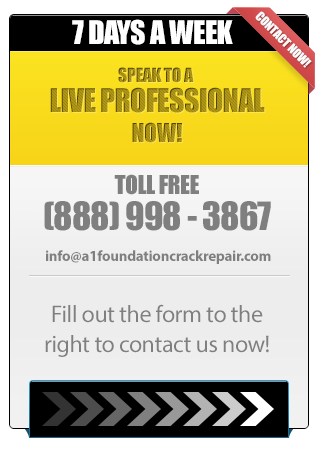 Specializing in Crack Repair throughout MA, RI, NH, & CT.